Properties in Sorauren average 4.5 out of 5 stars. Quiet retreat close to the action! We stayed here to see the San Fermin festivities (the running of the bulls) but because we had our children with us we didn't want to stay in Pamplona. Unai was waiting to greet us at our arranged time and was a well of information. His suggestions for the best way to experience the festival was perfect for us. The house was gorgeous - almost like being in your own mini museum! Every time you turned around there was something fascinating and different to study on the walls without feeling like you couldn't live in the house. The house had everything we needed. Plenty of hot water (and no Spanish bathroom smells). The yard was huge and you felt like you were in the middle of the countryside but there is a main shopping centre 5 minutes drive away. We stayed 10 days and it was perfect for some day trips to San Sebasti&aacute;n and other towns while also giving us some 'down' days of doing nothing. The only negative was the beds in the master could do with an upgrade as the bases were squeaky and sagged a little. You would definitely need a car as there are no restaurants or shops within walking distance but personally we loved that! The house has 4 bedrooms and 3 bathrooms and while there was only 4 of us the house could easily and comfortably fit 8. I would highly recommend this to anyone wanting some tranquility in a beautiful authentic Spanish house. My wife and I stayed here for four nights and already have our return trip booked! We are coming back with our young adult children for San Fermin! Although a bit out in the country it is a beautiful spot and just as described. 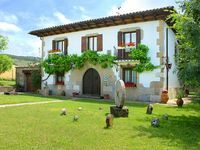 A great location as a base to visit Pamplona and the surrounding area. The culture and the people in this part of Spain are really wonderful.